Tomatoes are such a wonderfully diverse crop, standard fare but so independent. They keep gardeners engaged -- in their gardens and with each other. Maybe in less challenging environs it isn't so, but here in the north there is hardly a gardener who doesn't mention their tomatoes when talking about how their year went. A vine ripened tomato is something to crow about. And favorite varieties are not something to be agreed upon, nor need they be. Here are some of my notes over the years as I've had fun experimenting with different, mostly old-time varieties, and harvesting a good crop in my short season garden. Two years ago I received some Early Chatham seed from Jim at the Chatham Experiment Station (here in the U.P.). Someone had sent him the seed which had been grown in Houghton County since 1940’s, and he passed it on to me. Early Chatham had been introduced from the Chatham Station in 1939 by the breeder Dr. A. F. Yeager and was a popular tomato in the northern areas at one time. It was dropped from commercial sources between 1988 and 1991. There was one person from Vermont offering the seed through the Seed Savers Exchange in 1993, but I received no response to my inquiry to him, and the next year that listing was gone. Last year (1994) I distributed, through NSN and SSE, ten samples of seeds including one to Jim Ternier of Prairie Grown Seeds in Canada. This year he is selling it through his catalogue. So it is once more back on the market, though possibly temporarily. But I’m still offering it, and I assume at least some of the folks I sent seed to will have saved seed themselves, and will share with others, and so on. Maybe it isn’t even that it is a good little tomato that makes me so fond of the Early Chatham. I think it is because I know the story and it’s a local story. Someone from Crystal Falls wrote to me that he was a tester of this tomato as an Ag student in High School. He says, "they were a tremendous improvement over what was available then up here". A loss of a variety or line is a great loss, but I think we also lose a great deal when we lose the stories that go with the seeds. Tomatoes were pretty good. A smallish, soft, yellow tomato called Wendy was a new find for me, early maturing and good, if mild, flavor. I continue to plant a few of the old indeterminate Yellow Paste, a small pear shaped yellow tomato with a great flavor, just perfect for popping into your mouth when walking through the garden. I tried a new staking system for the indeterminate plants, poles tied into four pole tipis, each leg set outside one plant and that plant tied to that leg as it grew. The poles were 1-2 inch poplar saplings, 5-6 ft tall, the legs set two to three feet apart. They were easy to set up and worked great. To cover when the fall frosts came I laid blankets along either side of the leaning wall of tomato plants. Not real easy but it worked. Ripe tomatoes on the vine! And tomato sauce until I ran out of jars. It’s good to have a year like that once in awhile. Makes up for all those years we have to bring green tomatoes inside to ripen in order to get red ones. Early Chatham and Earlirouge continue my mainstays and favorites. Vendor did fine, too. I grew a crop of Anton (a large, pink paste heirloom) for seed. But even in this warm year, they were slow ripeners. Guess I’ll have to leave the maintenance of that variety to someone in warmer climes. A friend gave me some varieties to try: Brandywine, which I found rather bland and later than EC and ER, but nice large fruit. Roma barely ripened at all. Siberia was very large, and ripened along with Brandywine. Both of those would be good to try if you’re looking for a beefsteak, mid-early ripening tomato. Bulgarian Triumph looked like it would do well, but I broke the plant off early on, so it wasn’t a great test. The one branch left ripened its fruit very early though—reminding me that pruning is a good idea for the short season grower. I staked all the tomatoes as usual (most of the varieties are indeterminate), but ended up taking a lot of them down late in the season in order to cover them easier when the frosts started. If it’s wet, it’s nice to have them up off the ground/mulch (and it’s much easier to prune); but it’s also much easier to cover them if they’re growing on the ground, and the warmth of the ground gives them some protection from cold nights. No one best solution here. Early warm, then cold; dry then wet, wet, wet. Everything slow and late to ripen. Then a freeze mid-July, and frost mid-August. 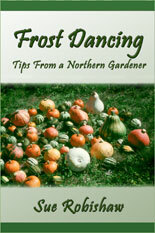 Ah, the wonders of gardening in the north woods! But, as always, things to learn. I didn’t stake the tomatoes this year, though almost all of the varieties planted were indeterminate. This turned out to be good since they were easy to cover when the summer freezes and frosts hit. Though I did loose some to rot because of the wet weather. A compromise, as usual. The earliest, and best cropper of the eight varieties I grew was Minnesota Large Yellow. Oligvose, a 1.5 x 2.25 pink paste, came in pretty good, too. Two large, convoluted varieties, though not as early or prolific, made a good showing and I will probably grow them again -- Acme and Wedekind. In a better season, they should do well. All in all, not a bad tomato year, in spite of the weather. Tomatoes were left to sprawl again, and due to the wet weather, quite a few were lost to rot and slugs. I guess I will go back to staking, or maybe will make short cages. The slugs seem to be proliferating faster than whoever or whatever eats them. Apparently the weather was great for them. But there were plenty of tomatoes for us as well. My old stand-by, Earligrouge, was, as usual, the top tomato in the field, with Early Chatham close behind, though with smaller fruit. Oligvose did well, too. Tiger Stripe ripened well, but the loss to rot was great. As interesting a tomato as it is, I don’t think I’ll grow it again. I finally came up with a very workable tomato trellising system this year. In the past I've tried both tying to stakes and letting the plants run on the mulched ground. But it's hard to cover staked tomatoes with blankets, my remedy for a short season. And in a wet year (such as this one), I lose quite a few to rot, even on mulch. So I looked around for something else. Something not disposable, something I didn't have to buy, something fairly easy to put on and take off, something that would keep the tomatoes up off the ground, yet allow me to cover them easily when frost threatened. Piece of cake, right?! Well, as it turns out, for me, it was right there beside the garden, just waiting to be reincarnated as tomato racks. Heavy woven wire fencing, or hog fencing as it's called around here, about 5 feet high, smaller openings at the bottom and larger at the top.. We had gotten many rolls of used and abandoned fencing years ago from a local farmer. I'd cut it up into manageable lengths and had used it for pea fence. But when I decided sticking brush in the ground was easier for the pea patch, they had been stacked aside. They loved the heat! I planted six different varieties this year, and once again my old standby Earlirouge came out on top. The rest were new, with Mary’s Paste being a bit spotty with fruit but a good sized paste, and Poll Robson being an interesting color of dark orange over dark red, but the latest maturing. Victorio was a prolific grower of vines -- too weedy for me. Extra Eros didn’t have great fruit, but they ripened fairly early. They were many shades of red, light orange and medium orange -- pretty but hard to judge when they were ripe. The last was Big White. Not a lot of fruit, but impressive large and meaty globes, and not too bad with maturity. I’ll probably give this one a go again. It wasn’t a great TOMATO year, but I was able to put up a modest amount of sauce and juice. My tomato challenges started in the greenhouse when the entire flat of my main Earlirouge tomato gave up. Seed problem? Soil problem? Unknown disease problem? Maybe they knew what the summer was going to be like and just didn’t want to. It was too late to start a new batch, so I stopped by a small, homestead greenhouse and bought some hybrid Flora America, which the women told me in a "no nonsense I have no time to chat this is what you want" way, that that was what I wanted. OK, who can argue with that? They turned out to be OK. Semi-determinate and not exactly exciting taste wise, they put out a decent supply of medium large globes, many of which actually ripened. If you want to go hybrid, this isn’t a bad tomato. 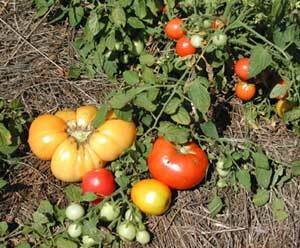 But the highlight of my tomato patch was the old Minnesota Large Yellow. I really appreciated it this year with the demise of my favorite Earlirouge’s. It’s a variable medium size yellow semi-determinate tomato that grows well, matures well and has good flavor. It's rather juicy for good tomato sauce though. I’ve decided to give up on the old, indeterminate Yellow Paste. I love the flavor of the small fruits, and I keep trying, but they take up a lot of space (prolific vines) and only mature well in the best years. They simply need a longer season than I usually have. Same for the large fruited, meaty Acme. Sigh. But there are many other varieties to play with, so I guess it’s not the worst loss. One that showed promise this year was Wedekind. It’s also a tall, lush growing vine, but it had more fruit which was large and juicy. A later tomato (as I’ve found all of the large fruited tomatoes to be), it still matured some fruit this year. I’ll try it again. Most years are better for tomatoes than this one. I let one volunteer tomato grow this year, as it came up early and was in a convenient spot. A small plant with small red globes which matured early and had good flavor, this was a wonderful surprise. I can’t wait to plant the saved seed next year to see if it continues to be such a great plant [later note: it did!]. I haven’t any idea what the parentage might be as I haven’t grown any tomato like it, and there were no tomatoes growing in this plot last year. Of course, tomato seed is notorious for surviving compost piles and I had put some compost on this plot. Maybe a sport of small fruited but long vined Victorio? Or of the determinate but larger fruited Early Chatham? I again had trouble with cutworms, in spite of taller collars. So I cut apart a stack of plastic yoghurt containers I had and placed them (with some difficulty) around the growing tomato, pepper and broccoli plants, securing them with large paper clips. This worked fairly well, except for the one cutworm I found INSIDE the slightly loosened plastic collar on one plant. Persistent little buggers. But then, they aren’t doing anything we aren’t doing so I guess I can’t complain too much. I also tried tin cans, having read about that idea but that didn’t work either, the cutworms just crawled up and over. My solution for next year is tall, sturdy, tight (relatively speaking) collars with a ring of wood ashes around the stems. But then, I’ve found all insect problems to ebb and tide over the years, so maybe I won’t have any problem at all with cutworms next year. One can always hope. Another try at the "ideal" tomato support this year. The fence U's turned out to be not so great as the heavy vines tended to damaged by the wire, and they were rather a bother to disentangle vines from fence. So I engaged my patient, resident woodworker and problem solver (Steve) and we came up with a design for a wooden rack using some poplar boards we had had milled a few years ago. Three boards running the length of the bed, with 12" legs, and cross pieces every 9" (my plants are planted in two rows, 18" apart). As long as you get the rack on before the plants get too large, it's easy and it worked very well. Easy on the plants, easy to cover, easy to reach in and around to get the inner tomatoes. I like it. It was used for the semi-determinate Earlirouge and Minnesota Large Yellows. I went back to pole t-pees for the tall indeterminate varieties. We had an unusually long, warm season with a very hot and dry July and no frost until October 8. An incredible year for tomatoes. The Earligrouge and Minnesota Large Yellow produced well in spite of the stress of the hot and dry season; they finally died down a natural death of old age. I've never had that happen before! But these semi-determinate varieties bred and selected to mature their entire crop early, not over a long period (which we seldom have). The tall indeterminates, though later maturing as usual, did get a chance to produce this year. The volunteer small tomato was a success, ripening its fruit early though it also gave out by early September. It provided us with beautiful and tasty salad tomatoes all summer. I named it "Rain" in memory of the rainy year it first made its appearance. No extremes this year, which was nice, just a little bit of everything. Unfortunately, though, a lot of blight in both plants and trees, including the tomatoes. Not a bad year though. I like the wood rack. Timing is a bit tricky, to leave the cold frames on long enough to protect the plants from late frosts, but to get them off and the racks on before the plants get too large. I've finally decided that though I am very fond of the Minnesota Large Yellow and Early Chatham tomatoes, they are too juicy since my tomatoes mostly go for sauce. I'm going to cut back on the number of those I plant. And though I continue with the various indeterminates, I do wonder why. They're interesting, but they simply are not early enough to be reliable producers. Another summer with extended drought and hot conditions in July/August. And though we did get the all too usual late June frost, no hard frost or freeze in the fall until October 12. I wouldn't want to try to garden without mulch. Unfortunately, another bad year for blight. But we got a pretty good harvest anyway. Note to put paper guards around transplants RIGHT AWAY -- don't wait. I know, I should know that by now but... Oh well, I only lost three plants. It could have been worse. I'm using heavy paper or light cardstock, mostly scrap of this and that and that works well. About 4" tall, wrapped fairly tight around the stem and pushed into the ground a inch or so. It works when you do it, not when you don't. I finally abandoned the indeterminate tomatoes and planted almost all Earlirouge, with a few Minnesota Large Yellow and a trial of a variety from Jim Ternier of Prairie Grown Seeds called Rosebec (like Earlirouge, it also is a Canadian introduction). It was a nice medium size pink that did OK, similar in size and taste to Earlirouge, but not quite as good a producer for me (of course, my Earlirouge has had many years to become acclimated to my garden). In spite of my propensity for many varieties, next year I'm going to go to just planting Earlirouge, and a few of the small Rain's for salads. What a change that will be from my years of trialing so many varieties (and having at it, too)! I experimented with planting both ER and Rain seed directly in the garden mid-June and they did surprisingly well. The Rain better than ER, but they gave me late fresh tomatoes when the main transplanted crop was pretty much done. I'm going to try a second planting of Rain the end of June next year. I'm still having a big problem with blight (though I can't complain too much as the pantry is well stocked with enough jars of tomatoes for winter eating), so I was careful to save seed from only the best, last to succumb to blight plants. I'm looking forward to a healthier year next year. Having a really strong early maturing variety makes late blight not such a disaster for me as it is for many people.